In our second half century of publication, the Massachusetts Review plans to dramatically increase the amount of fiction, poetry, and socially-engaged nonfiction we publish in translation. Today, we see a great need for literary journals to internationalize—to open their ears and their pages to voices from outside the United States, and to writers in languages other than English. MR believes we have a real opportunity for synergy with friends and colleagues from local institutions, given the strength of the University of Massachusetts Amherst programs in translation, of the locally-based translation studies journal Metamorphoses, as well as of the American Studies Diploma Program at Smith College (a one-year graduate program exclusively for international students). But we will of course need the help of readers, colleagues, and translators from across the globe. To that end, we announce the Jules Chametzky Translation Prize. The Jules Chametzky Translation Prize, sponsored by the Massachusetts Review, will be awarded annually to a translation published within our pages; the prize will award $500 for a work in translation, alternating between poetry and prose. Poetry translations published during a year in which the award is given to prose will be considered along with the publications of the following year, and v.v. All translations published by MR will be considered for the Chametzky prize, provided that -- as per our general guidelines for submissions -- a copy of the translated text is submitted along with the translation. Judges for the award will be MR's Translation Editor, Ellen Doré Watson, and Jim Hicks, along with an additional third judge, chosen yearly from the local pool of translation experts. MR editors are not eligible for the prize. The winner of the eighth annual Jules Chametzky Translation Prize is Alice Guthrie, for her translation from Arabic of Atef Abu-Saif's "The Lottery," published in the Summer 2017 issue. Read her thoughts on translation here. The winner of the seventh annual Jules Chametzky Translation Prize is Paula Bohince, for her translation from Italian of Corrado Govoni's poem "The Palace of the Soul," published in the Spring 2016 issue. Read an interview with her here. Paula Bohinc's most recent poetry col­lection is Swallows and Waves, published by Sarabande in 2016. Corrado Govoni (1884–1965) was a lead­ing figure in the Crepuscular movement in Italian poetry, and a contributor to Futurism. The winners of the sixth annual Jules Chametzky Translation Prize are Aleksandar Brezar and Enis Ćišić, for his translation from Bosnian of Karim Zaimović's short story, "The Secret of Nikola Tesla," published in the Fall 2014 issue. Enis Ćišić is an illustrator and comic book artist, working as a 3D animator at an advertising agency in Sarajevo. He is the creator of a number of music videos and album artworks for notable bosnian musicians and bands. His work, including large-scale drawings of famous film scenes as well as other illustrations, was exhibited throughout Bosnia and Herzegovina, while his short comic books were published in various magazines throughout the former Yugoslavia. Karim Zaimović was a Bosnian comic strip artist, journalist,r adio host, and writer for many publications, including Lica, Mladina, Oslobodjenje, The Phantom of Liberty, and BH Dani, in Sarajevo. He was killed by a shell in August of 1995, at the age of twenty-four, only months before the war’s end. The winner of the fifth annual Jules Chametzky Translation Prize is Peter Kahn, for his translation from Spanish of Márgara Russotto's poem "Of Useless Knowledge," published in the Fall 2013 issue. The winner of the fourth annual Jules Chametzky Translation Prize are Bruce and Ju-Chan Fulton, for their translation of Kim T'ae-Yong's "Pig on Grass," published in the Summer 2013 issue. Bruce and Ju-Chan Fulton have translated numerous volumes of modern Korean fiction, most recently River of Fire: Stories by O Chonghan, from Columbia University Press. They have received a National Endowment for the Arts Translation Fellowship, the first awarded for Korean translation, among many other awards and residencies. Kim T'ae-Yong's work appeared in English for the first time with "Pig on Grass," which originally appeared in Korea in his 2007 short-story collection. He is also the author of the novel Nothing to Leave, Nothing to Hide. In an interview with MR contributors Regina Galasso and Chang Young Park, Ju-Chan and Bruce discuss their work, their projects, and the art of translating from Korean. 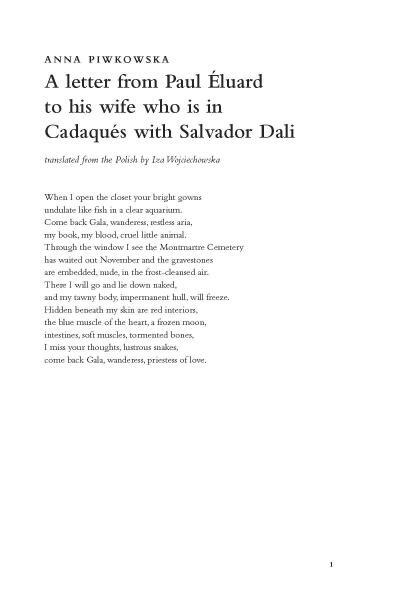 The winner of the third annual Jules Chametzky Translation Prize is Iza Wojciechowska, for her translation of Anna Piwkowska’s poem “A letter from Paul Éluard to his wife who is in Cadaqués with Salvador Dali,” published in the Winter 2012 Issue. In an interview with MR, Wojciechowska discusses her translations of Piwkowska, her current project, and the intricacies of translating from Polish. The winner of the second annual Jules Chametzky Translation Prize is Michael F. Moore, for the excerpt from his translation of Erri De Luca's The Day Before Happiness, published in the journal’s Casualty Issue. Michael F. Moore has also translated De Luca's Three Horses and God's Mountain. He has new translations coming out of Alessandro Manzoni's The Betrothed (Modern Library, 2013) as well as Primo Levi's The Drowned and the Saved (Norton, 2013). His other work includes translations of Sandro Veronesi, Franco Moretti, Guido Ceronetti, Umberto Eco, and Joseph Ratzinger. Moore received his Ph.D in Italian Studies from New York University, and has worked as translator and interpreter for the Italian Mission to the United Nations, as well as the Italian Cultural Institute, the Consul-General of Italy, and the Italian Trade Commission. He also chairs the Translation Fund for the PEN American Center. In an MR2 podcast, Moore discusses his translations of De Luca, and much more, in conversation with Translation Editor Edwin Gentzler and Editor Jim Hicks. The winner of the inaugural Jules Chametzky Translation Prize is Rebecca Gaye Howell for her translation, with Husam Qaisi, of excerpts from Iraqi poet Amal al-Jubouri's Hagar before the Occupation/Hagar after the Occupation. This translation from Arabic into English appeared in the journal’s Winter 2010 issue (5104). Rebecca Gayle Howell’s poems and translations have graced the pages of Ninth Letter, Ecotone, Indiana Review, Hayden’s Ferry Review, and Poetry Daily. She holds a combined MFA in Poetry and Translation from Drew University and was a 2010-2011 fellow at the Fine Arts Work Center in Provincetown, Massachusetts. In December of 2011, Howell & Quaisi’s translation of Amal al-Jubouri's Hagar Before the Occupation/Hagar After the Occupation was published by Alice James Books.